Grass-fed beef already has the upper hand over conventionally raised beef in that it offers fuller flavor and more heart-healthy omega-3 fatty acids. 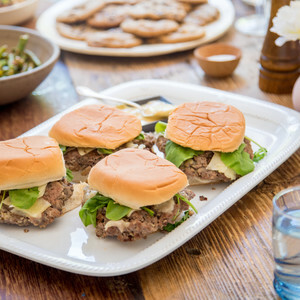 But when the overall quantity of meat is reduced by blending it with chopped mushrooms, this burger becomes an even better choice. And it tastes great, too. Topped with shaved Parmesan and served on a bun with a side of sriracha-spiced green beans, it’s a satisfying meal.